This research was updated in 2017. In Victoria, there are an estimated 104,622 people with dementia in 2017, which is estimated to increase to 134,486 in 2025 and 280,241 by 2056 in the absence of a significant medical breakthrough. This is estimated to cost Victoria $3.7 billion in 2017, which is expected to soar to $4.7 billion in eight years, by 2025, and to $9.4 billion by 2056. The following charts contain data for 2017 and projected data for 2050: click the links to read the PDF. Click here to see the data by Victorian Local Government Areas*. Click here to see the data by Victorian State Electoral Districts*. Click here to see the data by Federal Electoral Divisions*. Click here to see the data by Victorian Health Region*. * All data sourced from a NATSEM University of Canberra. Research commissioned by Dementia Australia Vic in 2015 released in February 2016. Read the media release from 10 February 2016 about this research, conducted by NATSEM, University of Canberra, here. Listen to the 2016 interviews with Maree McCabe, CEO Dementia Australia Vic on 3AW, ABC Ballarat and ABC Gippsland. Listen to Dan and Jane Gardam talking to Jon Faine on 774ABC. Dan is 63 and living with dementia. Or you can read this story that featured across Leader Newspapers in February 2016. Read an overview of the 2016 research findings here. 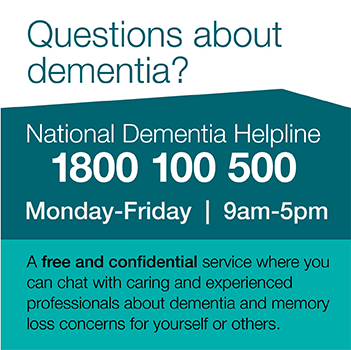 For a summary of dementia statistics across all of Australia, please click here.